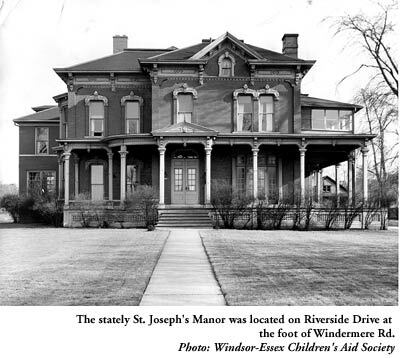 The Windsor-Essex Children's Aid Society is located on Riverside Drive in a Walkerville building that replaced St. Joseph's Manor, a mansion which housed troubled kids. A former resident (photo right) has provided The Walkerville Times with her memories of what everyone referred to as St. Joe's. 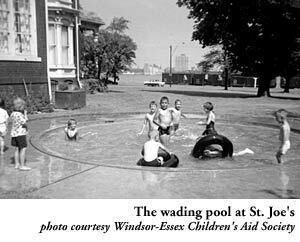 Children were brought to St. Joseph's on Riverside Drive in Walkerville because of abuse, abandonment, or for adoption placement. There were also some just hard to handle kids like me - usually teens or pre-teens who had gotten out of hand at home and were placed at St. Joe's where social workers helped the Sisters of St. Joe's keep us in line. Usually a child would live at St. Joe's for a week to a month and then would either return home, be adopted or go to a foster home. When I went to St. Joe's in the 60's, I was a pretty cocky young girl. On my first day, I saw some girls cleaning and I asked one why she was washing the floor. She replied, "We all have chores here". I said, "Oh ya, well not me". About a year later, I was cleaning and a new girl came in and asked me what I was doing cleaning. When I explained she replied, "I sure won't!" I just turned my head and grinned. Was she in for a rude awakening! The older kids also helped out with the younger ones, including the babies. One winter night around two or three in the morning, the teen girls were awakened by one of the Sisters to help some new arrivals. The police had brought in three abandoned kids wrapped in blankets. The youngest was barefoot, as the police couldn't find any shoes in their house for her. They all looked like they had rolled in dirt; their hair was matted, one had gum in her hair, and one had to have his head shaved. They were all very thin and frightened but they didn't cry - I don't think they had the strength. It wasn't until they were bathed and put in pajamas that they began to smile. We fed them a snack and put them to bed and in the morning they ate everything they could. I was glad for them knowing the Sisters would take them under their wings and try to make their world a happy one. Then one day I came home from school and they were gone. No warning, just gone. Then there was Janice, a little girl who had spent most of her home life in a closet. She was about four or five and she had been so traumatized she couldn't speak. With love and patience on the Sisters' part, you couldn't keep her quiet. She followed me everywhere so we became "buddies". I was happy when she was placed in a very caring home. St. Joe's was a huge place - I can't imagine that at one time a single family had lived there. One of the rooms had been converted into a chapel with pews and an altar complete with stained glass windows. The Sisters always seemed to be in there although one would stay behind because if they went in together, they would have to take turns coming out in the middle of prayer to break up a fight, soothe a skinned knee, or answer the phone. Despite their frequent visits to the chapel, you couldn't get away with much­ the Sisters always caught you. My theory was God was on their side! Fortunately, there was a huge playroom where we were allowed to cut loose. When we were given a snooker table we were in heaven. All good things come to an end however. The ball kept bouncing onto the tile floor making a racket and I think the sisters feared one of the younger kids would get hit with it. The table went into the basement so the boys had it to themselves because the girls didn't want anything to do with that skanky place. The only reason we would go down there was to get fruit and vegetables out of the cold cellar. When a new girl came we would spook her and tell her that a girl had once seen the ghost of a nun flying around the basement. There were about six or seven bedrooms upstairs - two for the Sisters, four for the kids and one for the babies. Part of upstairs was off limits and I'm sure it held a quiet room for the Sisters. Lord knows they needed it with up to fifteen kids running around. I shared a bedroom with the other teen girls. We spent a lot of time there and if we got bored, we would listen to music and dance in front of the big mirror. Sister Carmichael would come in and say something like, "Shame on you, don't be so vane!" but we could see the little smirk on her face. She was a wonderful nun but I remember she was always ill and one day she just wasn't there anymore. We had our own bathroom off of our bedroom and once another girl and I decided to dye our hair black. When we woke in the morning, our faces were black too and our pillowcases had not fared any better. Soap and water could not remove the evidence. Passing the nuns to get to breakfast, we heard laughter and a warning not to repeat that mistake again from Mother Superior. At Christmas the playroom looked like a picture from a fairy tale. 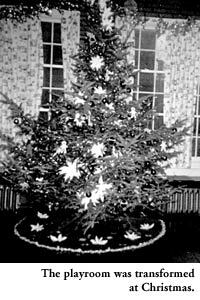 A donated tree that seemed at least ten feet tall was decorated with hundreds of lights, ornaments and tinsel from top to bottom. All of us would just sit and stare at the tree wondering what Santa would bring. We had special guests at Christmas and now that I look back, no doubt some families wouldn't have had Christmas without St. Joe's. St. Joe's yard went from Riverside Drive right back to Assumption Street, with an eight-foot high fence out back. There was a flower garden and a few wide steps that led into a huge backyard. At night the backyard was very dark and on occasion a boy or two were known to jump the fence. Sisters wore habits in those days and had long beads that rattled when they walked. By the time one of the Sisters got out to the backyard the boy would be gone. But I am sure the Sisters weren't deaf and could hear the fence rattle as he made his escape. The driveway went all the way back to what was probably at one time a carriage house. A groundskeeper/driver would take the Sisters to appointments, shopping, doctor's appointments, etc. In bad weather he would bring us back and forth to school (St. Anne's on Monmouth). There were two covered verandas on the west side of the house, upper and lower. Sometimes we would sit in the upper one and look out at the river thinking that if we could we would take a boat and run away. A girl and I did just that except we escaped by foot. We were gone about 24 hours and were grounded upon our return. I was lucky enough to have a terrific social worker named Marion Bednarski, a woman I will never forget. She was a gentle, compassionate woman. Alas I lost her too. She had to leave and I was heartsick but life went on. At one point there was a family in Riverside that was going to take me in as a foster child but the husband was in a bad accident and they had to back out. I never got a chance to meet them. I was put in a different foster home but I was so unhappy there that I asked my social worker to take me out. She wouldn't so I ran away. When I ran away a second time I was finally moved back to St. Joe's. I went to live with my sister when I was 15. Now that I'm grown and married with my own children, I can look back at St. Joe's fondly. My memories of my two years there will live forever in my heart. 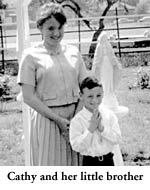 When Cathy composed her memories of her life at St. Joe's, she included some questions that had never been answered for her. Who were the original owners of the home? How did it become St. Joe's? After some research, we have some answers for Cathy. Two manors once stood on the present Children's Aid Society's property. One was owned by Hiram A. Walker and one by Chandler Merrill Walker (both nephews of Hiram Walker). Hiram A. was mayor of Walkerville from 1890-92, Chandler from 1894-95. Hiram A. Walker did not live in the manor that became St. Joe's as is commonly thought. His cousin (or possibly his brother) Chandler did. The Manor was named for St. Joseph, the patron saint of children and families and was opened in 1936 as a receiving home for the Roman Catholic Children's Aid Society. The Manor was torn down in 1969 when an Ontario Supreme Court grand jury decided that it did not meet the Ontario Fire Marshall's building requirements. The present building was constructed in 1970 and was named in honour of Roy J. Bondy, who served as the local Director of the RCCAS for 25 years.